Georgia's Zaal Kvachatadze looked very good as he motored through the first opponent in the 2013 AIBA World Boxing Championships in Almaty, Kazakhstan. Today we had the first Light Flyweights (49kg), the Welterweights (69kg) and the Light Heavyweights (81kg) showing their stuff in front of an appreciative crowd in this boxing loving country. This was was certainly the battle between Korean Hyeongkyu Kim and Aolin Zhang of China at Light Heavyweight. This was an epic bout with the Chinese boxer surging forward in bursts and the Korean willing to welcome him in. The Korean boxer fired off his jab from a very low position initially; almost from waist height and relied on his right hand to cover. This made it his punch hard to spot and meant his jab scored frequently but the tactic carried fairly obvious defensive consequences at times as well. With 50 seconds left in the third round the Korean dropped the Chinese boxer with a good uppercut. This was probably the deciding factor in the Korean taking the win. Perhaps not the most stylish bout of the session though also notable was the fight between Tanes Ongjunta from Thailand and Joshua English of Australia at Light Flyweight. This bout stood out for the sheer graft and hard work both boxers put in. They worked on each other with the same ferocious intensity for all three rounds. Neither fighter held anything back and the control of the fight went back and forth like a rocking chair supper-charged by a petrol engine. In general, the Thai team is looking great this year and it was indeed the Thai fighter that took the bout, though credit must be given to the Australian for pushing him all the way to the final bell. Mark Barriga took to the ring for his native Philippines against Road to Almaty boxer Ngoc Huynh from Vietnam at Light Flyweight. Barriga himself of course is a graduate from the Road to London program so there was an interesting angle to this one. The young Vietnamese boxer was certainly confident despite being in the ring with one of the best Light Flyweights in the world today. In round two, the boxers really began opening up with Barriga, who is a southpaw, using his overhand left and Huynh landing some nice hooks with his right. The Vietnamese athlete didn't look outclassed in any way and was well able to mix it but you felt that when Barriga did land it had more impact. Anecdotally, this seems to be something that is characterizing the WSB and APB boxers in contrast to their AOB colleagues in these Championships. AOB boxers tend in general to throw more shots than boxers on the other programs, but the WSB and APB boxers seem to be more energy efficient in picking their punches and ensuring that they land with more potency. This is clearly a function of the increased number of rounds they compete for in AIBA's other competitions. The tactical nuances aside in this particular case all three judges awarded the bout to Barriga 30:27. 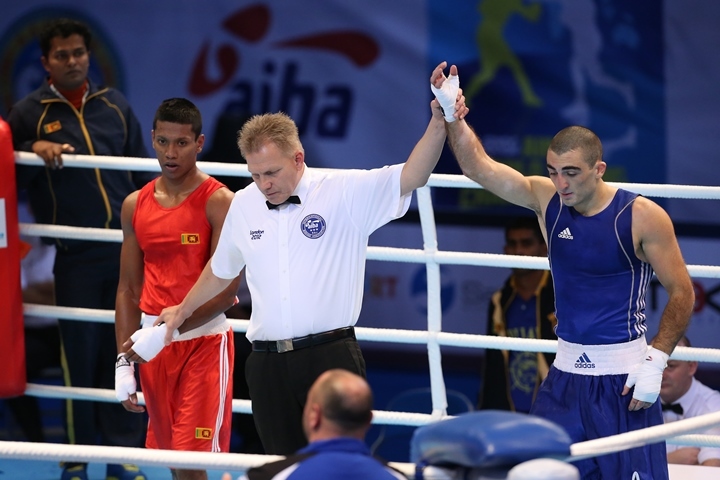 Georgia's Zaal Kvachatadze who boxed for the LA Matadors in Season II had an easy start to the tournament against Sri Lanka's Tharindu Gedara at Welterweight. Initially feeling his opponent out, the Georgian began landing absolute bombs halfway through the first round and dropped the Sri Lankan with a body shot for a standing 8 count with 1:23 remaining. The Sri Lankan tried to return fire but it felt like it was only a matter of time before he was in trouble again. Sure enough he was dropped for a second time shortly after with an enormous left hook to the body. The referee had seen enough with five seconds remaining of the first round. Kvachatadze certainly looks like one of the standout competitors in the Welterweight category early on. Welterweight Carl Hield from the Bahamans looked lively against Scotland's Lewis Benson. In the first round, Benson made good use of the whole ring he danced around his opponent clipping him with jabs, while Hield seemed a little off the pace. By the second round however there was a change in him, as though some of the early nerves were out of the system and he was free to box. From then on he caused his Scottish opponent some real problems and deservedly took the bout. "I had a slow start to the fight but I picked up after the first round when I started to get warm", admitted the Caribbean athlete. "But my dream is to have a fight with the Kazakhstan boxer, because I want the opportunity to prove my point. So I really needed that win. I hoped they were going to give me an Olympic champion, but against a Kazakh boxer at least I can prove my point because they always have good boxers". Russia's Belik Galanov looked very sharp at Light Flyweight against Vadym Kudryakov of Ukraine. Galanov has an unusual style of boxing but it seems to work for him, standing orthodox but with a long stance he often drops his hands below his waist to invite the punch so he can lean back and counter. The length of his stance gives him space to do this. He looked very comfortable against his Ukrainian opponent and while we didn't see enough of him to make any firm predictions, it will be interesting to see how he develops over the competition. Will he retain this exposed stance or will he get punished for it. Mongolian Erdenebayer Sandagsuren may also shock some people this year. Certainly he shocked the American team and Geremias Torres, whose coach felt obliged to throw the towel in to protect his fighter in the final round. With the American taking two eight counts in the first and another in the third, the power and accuracy in the Mongolian's hands was noteworthy. Watch this space. Kenyan Welterweight boxer Rayton Okwiri took on Australia's Daniel Lewis and looked good doing it. Whenever an Australian has taken to the ring so far this tournament, it has meant a serious battle for whoever is standing in front of them. Lewis kept this tradition alive by proving to be as rugged as his compatriots. The Kenyan however seems to possess a nice blend of skill, athleticism and a willingness to go forward and mix it up as required. He earned a well-deserved victory, and the support of the crowd. "AIBA really made me who I am today because I've been to all the "Road to" training camps. Italy, Baku, Wales. And now I'm here. It's helping me because I'm the only Elite boxer in my country, so I don't get decent sparring, and the training facilities are really bad so thanks to the AIBA program I was able to come here two weeks before, get good time with other countries and get a good training program" - Carl Hield, Bahamas and Road to Dream boxer.